The Republican, Democratic and Libertarian candidates for Michigan governor have vastly different approaches to addressing the state’s most critical challenges. 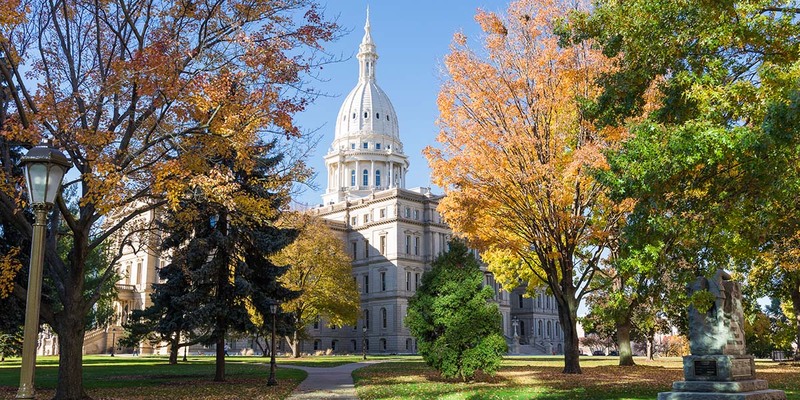 Throughout the 2018 primary campaign season, Bridge Magazine has asked the candidates to outline their plans for tackling some of the biggest issues facing Michigan. Here’s what Tuesday night’s winners previously told us. Whitmer said access to clean, safe drinking water and roads and bridges in good condition are priorities. Whitmer campaigned with the tagline: “Fix the Damn Roads.” Whitmer pitches an infrastructure bank, known as the Rebuild Michigan Bank, to pay for roads, bridges, water systems and broadband internet. It would offer loans and grants for infrastructure funding and leverage existing money from local, state and federal governments. Low-interest loans could be used as a state match to federal funding, and the bank could act as a revolving loan fund for municipal projects. She also said she would consult industry leaders to design a statewide infrastructure council to coordinate road projects with other needs, such as replacing drinking water lines or sewer systems, at the same time. “Repeal the retirement tax,” a reference to a 2011 change to the Michigan tax code signed by Snyder that taxed public and private pension income. That change was expected to cost pension-receiving recipients $343 million in fiscal 2012-13. Offer high school graduates two years of debt-free community college, skilled trades training or the equivalent aid for attending a four-year university. She has not detailed how she would fund its estimated $100 million annual cost. Consider hiking motor vehicle “user fees” to pay for a state infrastructure bank capitalized with up to $2 billion in new state bond debt each year for a decade. This would leverage an additional $1 billion a year in local, federal and private funding for state infrastructure. Diversify the economy by partnering with research institutions, expanding broadband internet to rural areas, and improving everything from roads to the Soo Locks. Expand training for those on food stamps by tapping into a 50-50 federal match for such training. What state has a K-12 education system you admire, and name a specific policy in that state that Michigan should emulate. The base per-pupil funding for Michigan public schools is $7,871. What is the proper level of per-pupil funding, and why? Michigan’s social studies standards are being revised. You can read a story about some of the proposed revisions here. Do you agree with the proposed changes to social studies standards, and why? Should third-graders be retained in grade if they are not proficient readers, and what research can you point to that backs up your position? “As Governor, my administration will establish the MI Opportunity Scholarship to give every student the chance to get the skills they need to compete for good-paying jobs, whether college is right for them or not. The MI Opportunity Scholarship may be used at skilled training programs, community colleges or four-year universities for two years of debt-free postsecondary education. “To participate in the program, students will be required to have skin in the game by: maintaining a high attendance record and a good GPA for the preceding three years of high school; enrolling full-time and completing eight hours of community service per marking period; and participating in a mentoring program to assist with career navigation. “Tennessee has a similar program, called the Tennessee Promise, which gives students the opportunity to attend a skilled trade school or community college debt-free for two years. After implementing this program, the statewide college-going rate increased by over five percentage points. In an interview with the Detroit Journalism Cooperative, Whitmer said she estimates the cost of her program at $100 million. “I think when you’ve got a $50 billion budget, $100 million is a small piece of what I think is in the budget to pay for this and I think we would find fantastic return on that kind of an investment,” Whitmer said. “The health of Michiganders and Michigan’s economy is paramount,” Whitmer said via email. “I worked across the aisle to make Healthy Michigan a reality and because of our bipartisan effort, 680,000 more people have coverage today. “These sites are man-made disasters, and we must address them. We need to have the resources on hand to keep Michiganders safe – and that includes the long-term recovery efforts around the Flint Water Crisis, managing contamination sites including PFAs, and being ready to respond immediately to any unpredictable environmental disasters. We must identify a long-term funding source to support these projects and keep people safe – whether that’s a bond, a dedicated funding stream, or by making sure that the polluters pay their fair share of the long-term cleanup efforts,” Whitmer said via email. "The Flint water crisis is an unforgettable failure of government at every level. Above all, the people of Michigan should be able to trust that the water coming out of their taps is safe to drink, cook with, and bathe in. Lowering the lead and copper rule to 10 ppb is a start, but shouldn’t be the end goal because we need to limit exposure to lead as much as possible in communities across Michigan. Frankly, efforts to expedite the process of replacing lead lines should have happened years ago. Michigan should be a worldwide leader in water policy, not scurrying to catch up to be just a little better than the bare minimum requires,” Whitmer said via email. "Our law enforcement are sworn to protect our communities, and we must give them the tools they need to keep dangerous weapons out of the hands of those who would do harm,” Whitmer wrote in an email. “I support this bill, it gives another tool to law enforcement and families to prevent tragedy." For a more in-depth look at where Gretchen Whitmer, the former Senate Minority Leader, stands on a variety of issues, watch her July interview with Bridge Magazine and the Detroit Journalism Cooperative here. Eliminate Democratic Gov. Jennifer Granholm’s income tax hike. That refers to legislation passed in 2007 under Granholm to raise the income tax from 3.9 percent to 4.35 percent, with the expectation it would be rolled back to 3.9 percent over a period of years. It now stands at 4.25 percent. Schuette did not respond to Bridge’s questions. His education agenda on his campaign website does not list any states which he admires for education policies. Schuette’s website doesn’t address funding levels for schools, but does call for consistent funding from year to year, so schools have more ability to plan ahead. Schuette not respond to Bridge’s questions. Schuette released a 10-point plan in March to boost literacy in Michigan. Parts of the plan include the appointment of a state literacy director, school reading mentors, summer reading programs and “dedicated reading centers,” which could be school libraries. The plan did not address the state’s third-grade “read-or-flunk” policy. Schuette’s campaign website says Michigan should “make it easier for students to complete college credits during high school or fast-track through community college programs,” which would help decrease college costs. Schuette supports the bill introduced by state Sen. Mike Shirkey, R-Clarklake. “Michigan has a responsibility to reevaluate and ensure that taxpayer-funded programs are not only efficient but that they are ensuring the best outcomes,” Schuette said in an emailed statement. “Welfare programs must always be judged on their ability to give a hand up to citizens in need of help and by their ability to identify and eliminate hurdles to helping able-bodied citizens find a place in our workforce. This is especially vital at a time in which Michigan has thousands of unfilled jobs, combined with a shrinking workforce that is limiting our growth and ability to compete with the fastest-growing states. "America is facing a mental health crisis and we must find ways to provide resources to help those who are hurting or may hurt others. In particular, school violence was a major concern for Attorney General Schuette when he took office, and that is why he worked with the Michigan State Police and schools to create Michigan’s OK2SAY school safety initiative," spokesman John Sellek wrote in an email. "In the bigger picture, Attorney General Schuette also has deep concerns with the general coarsening of our culture, where casual violence and killing is treated as mere entertainment, especially when it is directed at our youth. We have not seen these bills but we will look at them as we review all the factors that may play a role in finding more solutions, like OK2SAY, to stop violence. March 9 update: Schuette tells Gongwer news service that "The due process issue is of great concern to me," in regards to "red flag" laws. "The first focus ought to be mental health and mental illness," he said. Lower annual state revenue allowed under the Headlee Amendment – approved by voters in 1978 – from 9.49 percent of all personal income to 8.55 percent. Eliminate the Michigan Strategic Fund, which has broad authority to create economic development. In May, for example, it approved more than $600 million in tax incentives for $2 billion in proposed Detroit development projects. “a) Taxes are just as much a burden to families (and perhaps more so) than the optional cost of college expressed in Question 3. The real question here is how to we make parents better consumers of education? “b) In this vein, and regarding funding: Some (institutional) education critics have complaints about charter schools and other alternatives to public schools. Why is it that each time a charter school is created, we have an instant waiting list? Even in a phony democracy, the PEOPLE should get what they want once in a while. Charter schools are wildly popular – indicating that we need more choices free from the education bureaucracy. “The ‘sanitation’ of our curriculum led by Sen. Colbeck is simply wrong-headed. Social studies should be developed as a place to consider history from different perspectives – presenting a wide range of ideas about how we interpret history and social interaction. Both the Democrats and Republicans have used education as a wedge in their culture war – which most Americans find offensive. “Projecting our own fears of the future onto our children is one of the most unhealthy things we can do. I’m for a more inclusive society that isn’t fearful of others that aren’t like us. We should work to provide the earliest age-appropriate exposure to opportunities to learn about other religions, races, sexual identities and more. “I’m a supporter of deferred college entrance (which allows students to earn more resources for college); accredited transfer of Community College credits; and alternative training opportunities. My budget reduces the singular focus on higher education as a government priority – instead, creating a market-basket choice for students to direct resources. Learn more about where the Libertarian candidates stand on these and other issues. We have two major candidates each with their own deep belief in a cosmic money tree, not a spec of creativity, or original thinking. Cut taxes, sure,! Raise Min wage to $15? Just go to the money tree! s Just a splatter bast of moronic platitudes designed to appeal to the unthinking. A wasted opportunity! Center Right (Whitmer) vs. Loony Right (Schuette). It's a clear choice.